If you take ANYTHING away from today’s post, I want you to remember, it’s NOT Un-Christian to say NO! Did your jaw just drop? Does such a thought sound and feel like heresy? Christians are called to many things. We are to bear good witness, shine God’s light, share his word, serve, minister, worship, pray, love, show compassion, etc. The list goes on and on. But being called to do these things doesn’t negate that there should be an invisible line drawn when enough is enough. Yup, I said it. Sometimes enough is just enough and you must say NO. It’s called healthy boundaries…and discernment…and balance. It’s no small task to determine when and where so say no, but here are a few guidelines I use to help make thoughtful, healthy decisions. If ‘yes’ disables another person, say NO! If ‘yes’ causes you to stumble or stray, say NO! If ‘yes’ will leave you utterly burnt out and exhausted, say NO! If ‘yes’ finds you doing the same thing over and over again expecting a different result, say NO! If ‘yes’ leaves you miserable, lonely, and hurt, say NO! Keep in mind that sometimes ‘no’ doesn’t mean ‘never’ – it can also mean ‘not now’. Own the right to make that call. Keep in mind that sometimes ‘no’ doesn’t mean ‘never’ – it can also mean ‘not now’. WHY is it so difficult to say NO to harmful relationships, NO to stress, NO to obligation and NO to guilt? Because we want to help…we avoid pain…we dodge the awkward…we take the easy route…we feel responsible. The excuse list goes on and on but the truth is we’ll NEVER have the time and energy to say YES to the right stuff, if we are constantly weighed down by the negative, destructive, time wasters in our life. Allow yourself the freedom to say ‘NO’ – and actually do it. People will bully you and your conscience may taunt you but stick to your guns. When it’s the right choice, ‘NO’ is part of a bigger, better plan. When it’s the right choice, ‘NO’ is part of a bigger, better plan! What or who should you say ‘NO’ to? Like what you see? 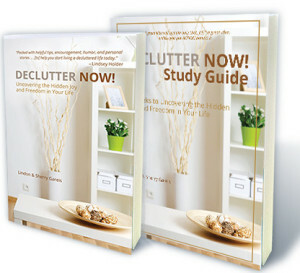 Be sure to check out our Facebook page at www.facebook.com/declutternow AND sign up for weekly blog notifications in the box to the top right. This entry was posted in Inspirational, Self-help and tagged Christian, decisions, disable, God, guilt, healthy, no, overwhelmed, sacrifice, say no, schedule. Bookmark the permalink. 2 Responses to It’s Not Un-Christian to Say ‘No’! I was just talking about healthy boundaries with a friend a couple days ago! What perfect timing!